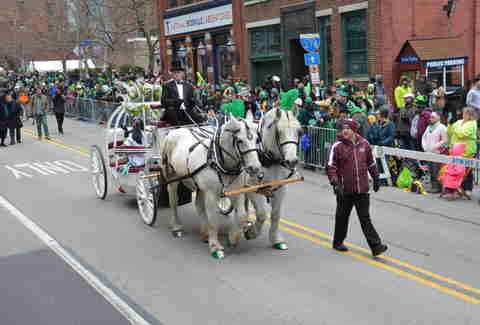 Pittsburgh has celebrated (and as history states, sometimes not celebrated) St. Patrick’s Day with a parade for nearly 150 years, through rain, shine, and of course, the infamous Blizzard of ‘93. The city has continued to add traditions to the holiday, like the introduction of Finn the Irish Wolfhound mascot in 2018, evolving it into one of the nation’s biggest and best Irish celebrations. While the ‘Burgh may not dye the rivers green like Chicago (can you imagine the work it would take to dye three rivers? 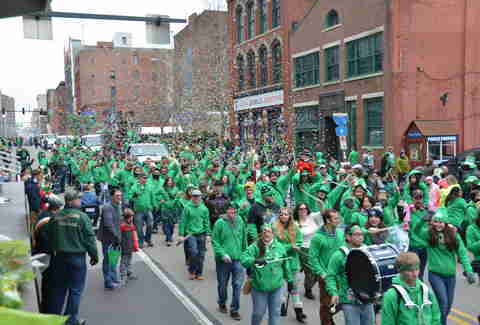 ), Pittsburgh’s Irish celebration has grown in recent years, even to the point of receiving national recognition; it’s even believed to be the second-largest St. Patrick’s Day parade in the United States (this according to Pittsburgh’s St. Patrick’s Parade Committee, which might be like a Pittsburgher saying that the Steelers are the greatest NFL team, so take it with a grain of salt). Pittsburgh’s parade includes 22,000 participants, 200 marching units, and floats representing a variety of cultures and heritages. 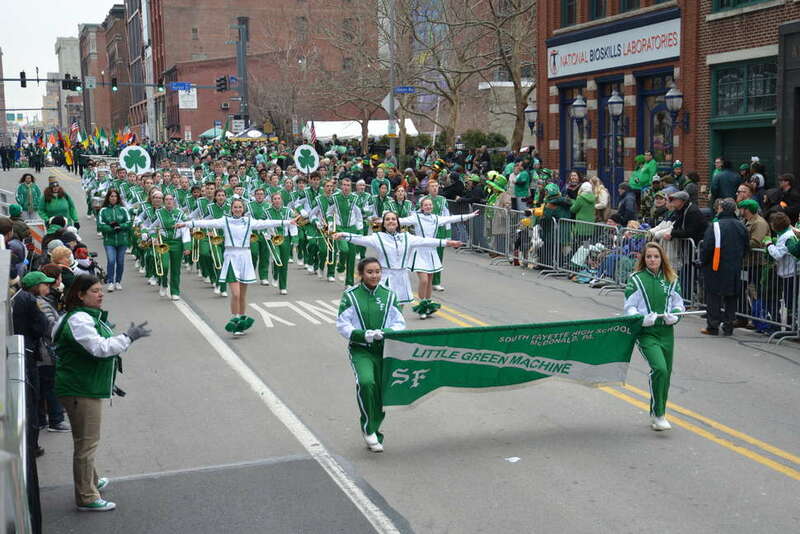 Here’s everything you need to know to about Pittsburgh’s St. Patrick’s Day parade, from the history, to the parade itself, to the hot spots to go to after. 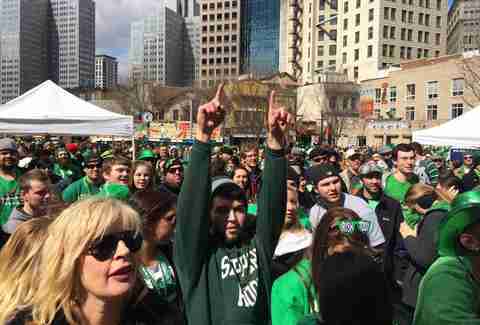 How far back does Pittsburgh’s St. Patrick’s Day history date? 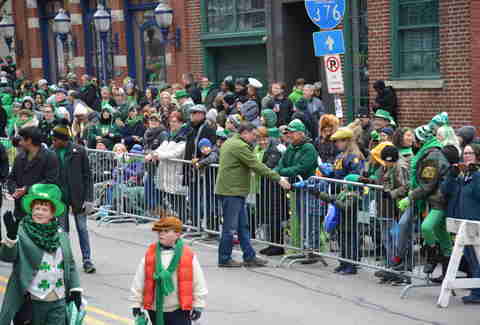 The first St. Patrick’s Day in Pittsburgh was March 17, 1869; however, at the first parade, wagons being unloaded at the emporium of Joseph Liebler affected the flow, and the police wouldn’t stop the delivery people because the Liebler business was so prosperous. Fortunately, the parade's a bit more organized these days. While the motto is usually “rain, snow, or shine,” the parade was canceled in 1903 due to snow and the next year, for some inexplicable reason, the parade was canceled again (not due to weather). In 1956, winter weather canceled the Saturday parade on a Friday, but on that Saturday, people stepped off anyway, with 9 inches of snow on the ground. At first, the rebel marchers were in trouble with the police, but eventually then-Police Chief Maloney gave in and even marched down Fifth Avenue with the group. Since then, weather hasn’t stopped Pittsburgh from marching, even during the Great Blizzard of 1993. What time does the parade start? What is the route? 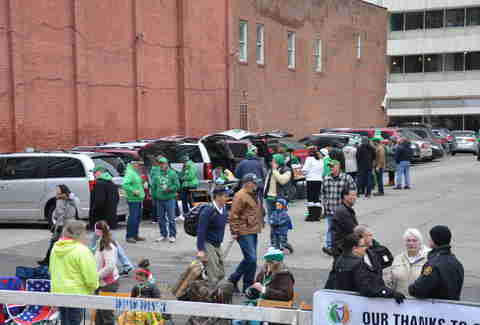 The parade starts at 10am on Saturday, March 16, 2019; parade formation will begin at the Greyhound Bus Station at the intersection of Liberty Avenue and 11th Street, and it’s the same route as last year’s. The parade will go from that intersection to Grant Street to the Boulevard of the Allies, where it will turn right. From the Boulevard of the Allies, it will go to the Reviewing Stand to Stanwix Street, and then disperse at Commonwealth Place. What’s the best viewing spot? Pretty much anywhere where you can pop a squat. It’s not as extensive as parades in other cities, but if you can find a spot on Grant Street, Boulevard of the Allies Downtown, or Stanwix, you’ll probably be good to go. Bring your lawn chairs; this time you won’t be saving spots for your car, but for your butts. Engage in a public protest or use the parade as a platform for something other than St. Patrick’s Day (so basically, if you’re hoping to use the parade as a Trump protest, it's probably not the best idea). Leave your issues/causes at home. Throw beads, silly string, or candy (this isn’t Mardi Gras). Don’t have signs with obscene language or run around naked (there will be children!). While it’s been cold in recent weeks, it has been gradually getting sunnier and warmer. Right now, it looks like it’s going to be cloudy and dry on Saturday, with a high of 47 degrees. Well, green, of course; you don’t want to be the only person in a different color (don’t be that guy or girl). You might want to wear layers since, y'know, it's Pittsburgh. Wear a hat and some sunscreen. Basically, go all out with green, but feel free to throw in some Pittsburgh sports teams, too (no one will object). If you live in the city neighborhoods, you’ll probably want to Uber or take a bus (don’t have to worry about finding a spot and traffic). If you live outside of the city, there are lots of public parking areas near the parade routes, but these will likely fill up fast, so get there early. Since the weather is getting nicer, you could also park somewhere in the South Side and walk across the 10th Street Bridge to Downtown. If you’re coming from the South Hills, you could take the T in, too. What else is there to do this weekend? There are family-friendly St. Patrick’s Day activities going on in Market Square, great food at Irish Fair in the Square. Mullaney’s Harp & Fiddle in the Strip District, known as Pittsburgh's #1 St. Paddy's Day party spot, will have live music starting at noon and going all day (same for Sunday, March 17). There will be pizza and giveaways all night at Howl at The Moon Downtown, from 5pm to 12am, and there's no cover charge if you wear green. 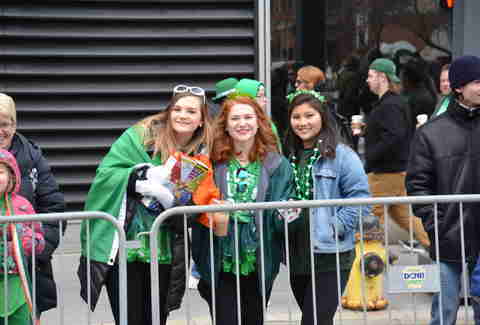 Also Downtown, you'll find the first annual St. Patrick’s Day Bar Crawl Pittsburgh, featuring 10 bars (including Howl at the Moon) plus drink and food specials and lots of free swag like beads and hats. Failing all that, you can always do your own bar crawl on the South Side, where a lot of the after-parade action will be (you can purchase a Line Hopper pass for exclusive entrance into four Carson Street bars, including Local Pittsburgh, Steel Cactus, Foxtail, and Skybar). If none of these ideas strike your fancy, here are other fun things you can do around Pittsburgh this spring. Megan McLachlan is a Thrillist contributor.